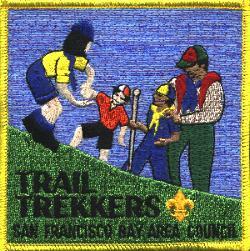 The San Francisco Bay Area Council offers a number of hiking programs for Scouts of all ages. The Trail Trekkers program is great for Tigers, Cub Scuots and Webelos. Rim of the Bay and Sunol to Del Valle make great outings for Boy Scouts and Venturing Scouts. The Trail Trekkers Program offers a series of hikes which are located throughout the Bay Area that can be completed by Cub Scout age boys from 6-11 years and their families. These are opportunities for outdoor adventures, some of which are more physically demanding while others can be completed by any age group. 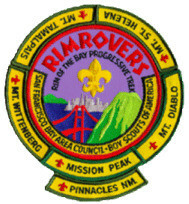 The purpose of the RIM OF THE BAY patch program is to encourage hiking and to bring into the lives of our Scouts a "mountain top" experience. There are six Mountains that surround our area that you hike up. When you finish the first mountain you get a patch and a "rocker" with the name of the mountain. Rockers are awarded for each additional hike completed. All of these trips can be accomplished in a single day. There are camping sites at or near most if your plans include an overnight camp experience. For Boy Scouts,this activity can contribute to the Tenderfoot Rank, the Backpacking, Camping, and Hiking Merit Badges; and Forester, Geologist, Outdoorsman, and Traveler for Webelos. These hikes are not approved for Cub Scout use. Secure (where available) the park folder which shows trails and also gives a short history of the area. For example, the Mt. Diablo folder states, "From here, you can see parts of 35 of California's 58 counties -- the view is unsurpassed except by that from 19,000-foot Mount Kilimanjaro in Africa." The park folder also includes natural history and a listing of mammals, reptiles, and plant life. Try to make your trip a "hike with a purpose" other than the earning of the patch. Please instruct your Scouts on the need to observe and obey the regulations that are in effect in National, State, and Regional Parks. On some trips you will be given the courtesy of passing across private property. Please repay these people's trust by keeping the area free of litter, respecting their property, and leaving the gates as you find them. Clean up and pack out any litter you may come upon. Perpetuate the good turn ideal. You will probably eat your lunch at or near the summit; be sure all bags, cans, etc., are packed out with you. Where it is necessary to cross highways, have your Scouts line up along the side of the road and when clear and upon signal, have the entire line cross at one time. Avoid stragglers or having individuals or small groups crossing at intervals. If everyone helps keep the record of Scouts' use a superior one, this will be a happy and satisfactory experience, and it remains that way for all Scouts who follow. This is a partial list of books which will make your trip better. Your library may have others which we have missed. San Francisco Bay Area Council established the Presidio Historic Trail Program over four decades ago. The Boy Scout Historic Trail Program was first established when Scouting had an official campsite on Rob Hill, with the distinctive round Trail Award featuring the Spanish Captain in helmet. The shorter Cub Scout Trail day hike was established with its own patch featuring the view of the Golden Gate Bridge in the early 1980’s. Begin at Presidio Museum (originally an Army Hospital), and proceed southwest on Funston Avenue. Turn right and head northwest on Moraga Avenue, passing the Officers Club. Turn right at the Flag Pole, observing the old cannons and the original Spanish Presidio Fort. Visit the Visitors Center on the Main Parade Ground (restrooms and interesting exhibits here). Turn left on Sheridan Avenue, proceed west to Lincoln Blvd. Stop at San Francisco National Cemetery for prayer or meditation and acknowledgement of deceased veterans serving to our country. Continue west on Lincoln Blvd., turn right on Crissy Field Avenue. Continue west on Crissy Field Avenue, underneath Doyle Drive Freeway, until it rejoins Lincoln Blvd. Continue north on Lincoln Blvd., then turn right to hike north on Long Avenue and Marine Drive following the bay coast into Fort Point National Historic Site. After visiting Fort Point (interesting exhibits and films here, and great views underneath the Golden Gate Bridge), hike south up to the Golden Gate Bridge Visitors Center. Continue west, then southwest on Coastal Trail past the old cannon batteries on the western side of the Presidio. Hike south until you reach Battery Chamberlain, where Cub Scout pack members may be picked up by automobile at this point (Boy Scout hike continues as described below). Return from Battery Chamberlain hiking north on Coastal Trail to Lincoln Blvd. Cross over Lincoln Blvd. and see West Coast World War II memorial. Continue north until trail on right enters Fort Winfield Scott. Continue to the right on Ralston Avenue, with the option of entering Fort Winfield Scott fields, then continue north on Ralston Avenue as it loops around Fort Winfield Scott. Turn left on Storey Avenue, then turn right and continue northeast on Lincoln Avenue. After going underneath U.S. 101 on Lincoln Avenue, turn left to hike toward Golden Gate Bridge Visitor Center. After stopping for restrooms and Visitor Center, hike 2.2 miles across Golden Gate Bridge. Troop may be picked up by automobile at Marin County Vista Point at the north end of the bridge (eastern side of U.S. 101 freeway, free direction for automobiles traveling from San Francisco into Marin County).